This neat recipe has 4 ingredients and it tastes great too! 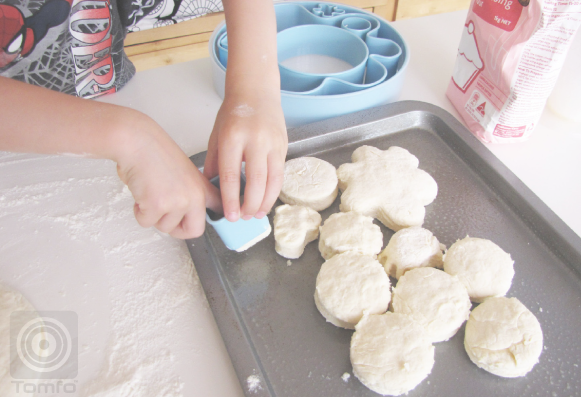 My little guy and I had fun making these scones together…they’re a cinch to make. One of the ladies who looks after our little guy made these with the kids at daycare and I asked how she did it. Mix the flour and salt together, then make a well in the middle, add the lemonade and cream and mix. Then place on a well floured surface. Then cut out with cookie cutters, the little guy had a ball making different shapes. Place on a greased baking tray close together. Serve with strawberry jam and cream, yum! A quick recipe that we will definitely make again. What recipes do you make with the kids? « Christmas tags to make with the kids + Repurpose Art Challenge No. 8!